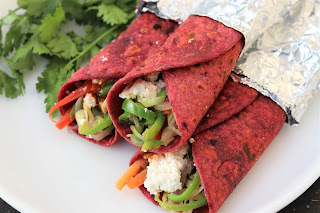 Learn how to make a very healthy Kids lunch box recipe, Veg Frankie Roll. We have given a healthy twist to normal Vegetable Frankie which is made using refined flour. 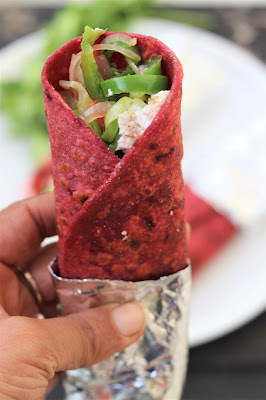 We have made vegetable Frankie recipe using Beetroot so it is much more healthy and nutritious lunch pr breakfast recipe for kids. 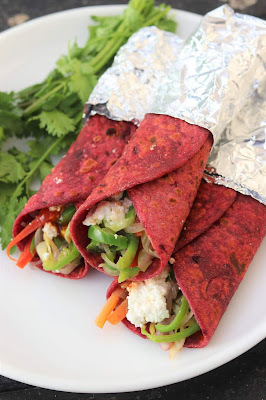 Must try this yummy, healthy Veg kathi roll or Veg Frankie recipe. 1. Grind beetroot in mixer grinder and knead a soft dough using the same. 2. Saute all vegetables in medium flame till cooked but crispy. Don't over cook the vegetables else it will turn soggy. 3. Roll out beetroot dough sheets on griddle. Spread tomato ketchup at base, place sauted vegetables in centre, top with chilly sauce and cottage cheese and roll out the Frankie. Cover with aluminium sheet or butter paper and serve coloured healthy delight to kids and family.